While far from the dinner tables and firesides of home, the Pennsylvanians encamped at Camp Wood, Munfordville, Kentucky, succeeded in celebrating some semblance of a Lancaster County Christmas in 1861. Pvt. 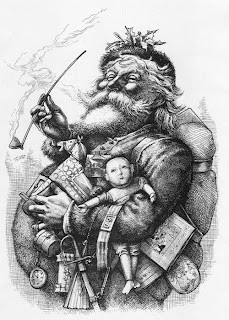 Lewis Jones, who served as cook for Company H, erected one of the handful of Christmas trees to be found in Camp Wood and decorated it with hardtack and “speck,” which I believe is a Pennsylvania Dutch word for some sort of fatty meat (maybe army slab bacon?). 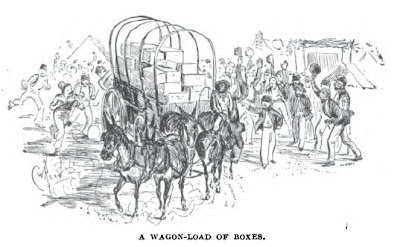 Through December, the regiment had been receiving a steady stream of boxes from Lancaster via the Adams Express, and the pace picked up closer to Christmas with boxes full of food items such as fruit cakes, jellies, butter, wine, and cranberries, as well as clothing and other dry goods. Earlier in December, Capt. 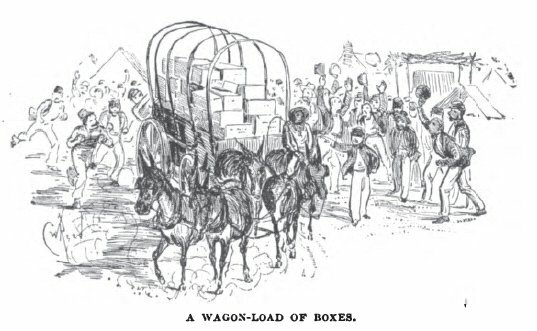 William G. Kendrick remarked to his wife, “Boxes are coming every day for Captains in the Regiment.” Just after Christmas he added, “I got a large Box from the County with sausage Pudding pies, a Turkey, some chestnuts and other little knickknacks. There was a lot of things sent for me to distribute and all that had no name on it I kept for myself.” Unfortunately, the barrel of sauerkraut sent by the citizens of Lancaster, which I’ll post about soon, had not yet arrived, but it would be enjoyed a couple days later. Morning fine and clear. Boys all in good humor on account of it being Christmas. Had Company Inspection at 9 o’clock. 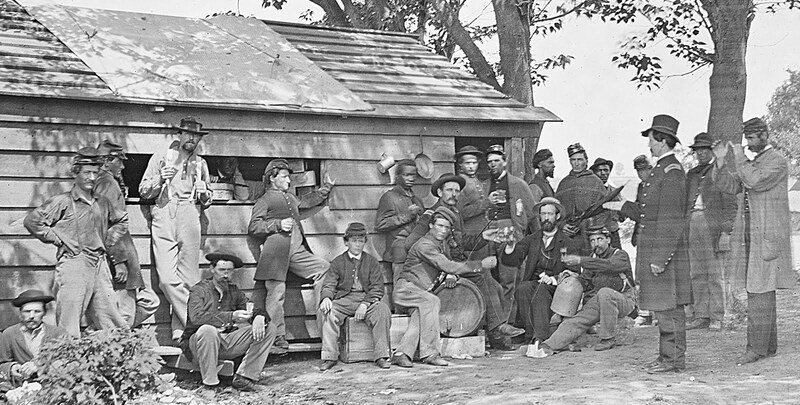 Colonel gave the men the privilege of going out of camp until 4 p.m. Had a regular Christmas dinner. Eat with Maj. Miles, Benedict, McCaskey, Blickensderfer, Lebkicker, Derby, & Rote. Had turkey pies which were sent by Mr. Blickensderfer. Had a Dress Parade at 4 1/2 p.m. Men all conducted themselves well today. Gen. Negley sent the Command Officers of the Regt. an invitation to spend the evening with him. 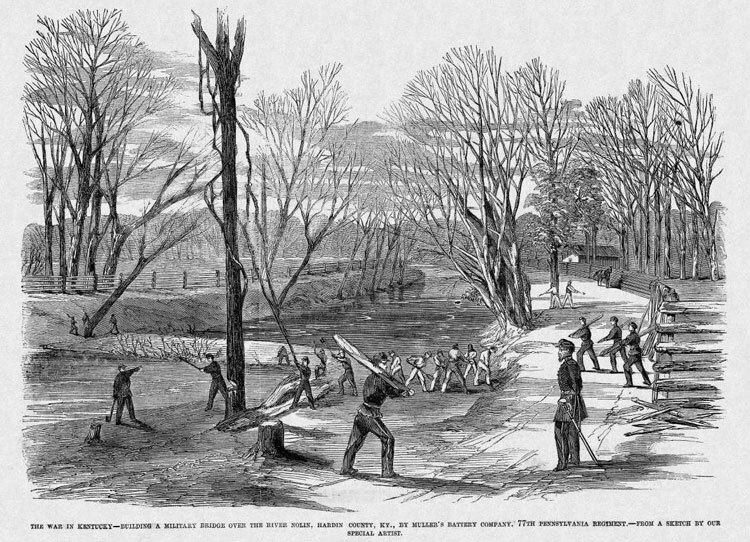 BANKS OF GREEN RIVER, KY. DEC. 26, 1861. In my last letter I was in error in stating that the Green River Railroad bridge had been so far repaired as to allow the cars to pass over. I made the statement upon hearsay. The bridge is about half a mile from our camp, but hid from view by the high bluffs which rise along the banks of the stream. I discovered the error after I had mailed my letter, and then it was too late to rectify it. Yesterday afternoon I paid a visit to the bridge, and found that there is much work yet to be done before it can be of any use. There is one span of about 70 feet yet to be put up, an it will require several weeks to do the work. 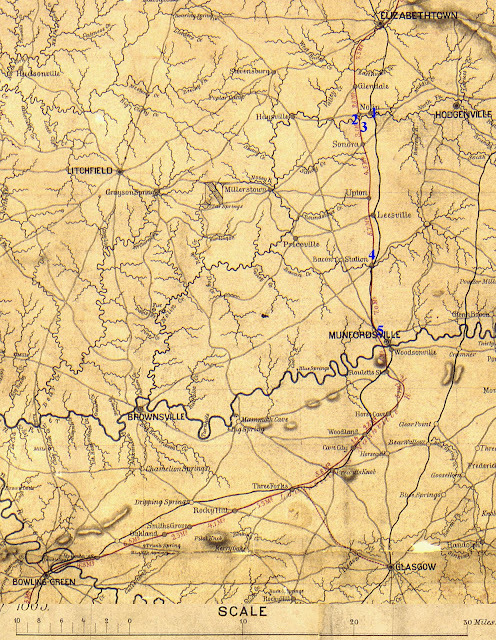 And until that is done I think there will be no advance of the Union army to the South side of the river. 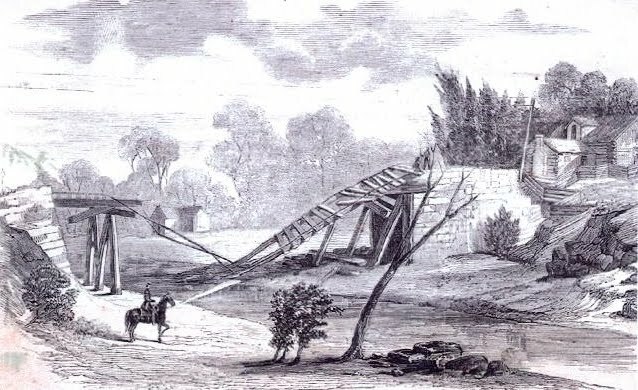 In the destruction of this bridge—which by the way is one of the finest iron bridges west of Pittsburg, and which cost nearly two hundred thousand dollars—the rebel managers have exhibited consummate strategic ability. 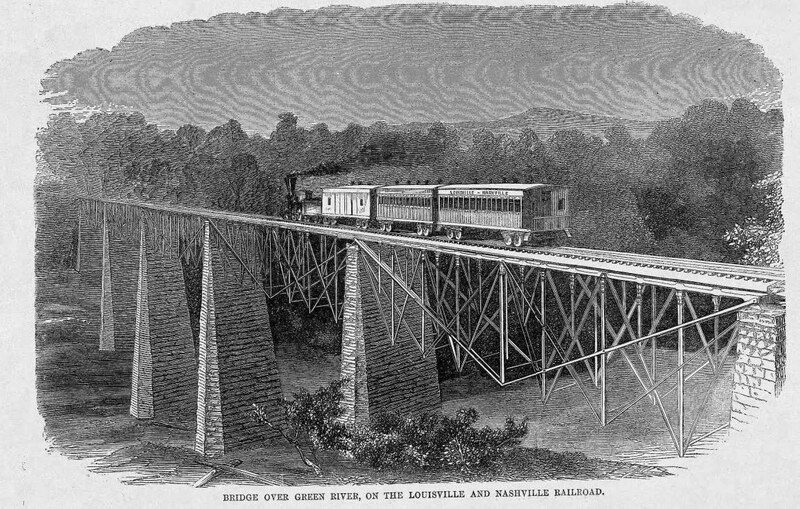 When Buckner discovered that he could not advance on Louisville without being whipped, he retreated across this bridge and blew it up. His allegation that the bridge was destroyed “by mistake” is all fudge, and was made no doubt to satisfy the more impetuous sons of chivalry rather than acknowledge his weakness. 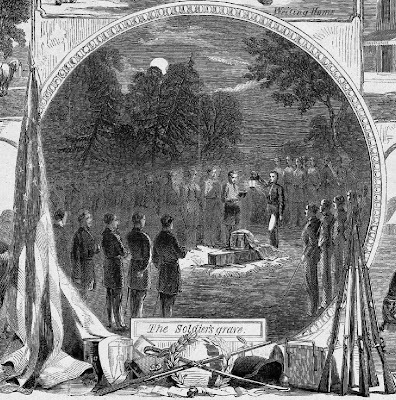 He knew, too, that it would be no easy matter for the Union army to advance in force without first repairing the bridge, by which time he could strongly entrench himself at Bowling Green, and call to his aid reinforcements. He has had time to do both, and is now doubtless well prepared to give us a pretty warm reception. That’s just it. All the trouble is owing to the persistence of the rebel leaders and rebel newspapers in deluding the mass of Southern people into this absurd belief. I could relate some of the most incredible stories prevalent among the lower classes of South, in reference to the objects of the war and of the character of Northern institutions. The tales of Baron Munchausen would pale before them. But the leaders see the desperate condition of their cause, and hence resort to the most unscrupulous falsehoods to prolong the struggle and save their own necks a little longer. The remark of the Governor of Arkansas, in a recent message, that “if the cause of the South fails, we who hold big offices will be ruined,” is a fair illustration of the logic of the whole crew, from Jeff Davis down to Buckner. Roast Turkey, with dressing and sauce. Lancaster County Pound Cake, iced. Now, no doubt, the perusal of this bill of fare will excite a smile on the face of more than one of your readers. But I must affirm that I never enjoyed a Christmas dinner with more zest than that of yesterday. All the substantials were present, if the et ceteras which usually grace the table at home on this festival were absent. The turkey was done to a turn, the ham was exquisite, and the mince pie would have tickled the palate of the most dainty epicure. The interior was prepared in Lancaster by the lady of one of the officers of Company I, and the frame-work constructed by the cook of the same company. I don’t exactly know whether these are the technical terms employed when making pies, but I think they are sufficiently comprehensive to be understood by the masculine reader: A lady of domestic habits would probably state the thing in a different way. In the 77th, the day was also happily spent. The usual rigid discipline was somewhat relaxed, and the men allowed more latitude than would be altogether prudent at all times. Many took occasion to call on their friends in the several encampments, and to visit the different points of interest in the neighborhood. But I am glad to say that none of them abused the privilege thus extended them. I passed through a number of encampments myself, but saw very little dissipation or disorder. In the evening our band serenaded a number of the officers, and made the night vocal with patriotic airs. The day throughout was pleasantly spent in the Division of the Cumberland. May all the brave hearts now here live to see many returns of the same festival! The 77th is rapidly improving in discipline and drill, and will soon rank as one of the best regiments in the service. We have clothing in abundance, and the rations are both good and plentiful. There are over a hundred Lancasterians now in the regiment, the names of whom I will forward you shortly. To-morrow our regiment will cross to the South side of Green river on outpost duty. The Rev. Chas. 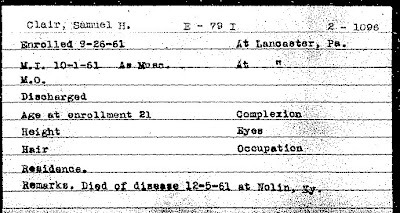 Steck, chaplain of the 79th, arrived a few days since and has assumed the discharge of his duties. He expresses himself much pleased with camp life. J. H. Sypher, an officer in an Ohio battery that was seemingly everywhere--especially early in the war--including sometimes with the 79th Pennsylvania. 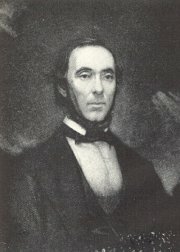 A. J. Sypher, a gunboat officer. 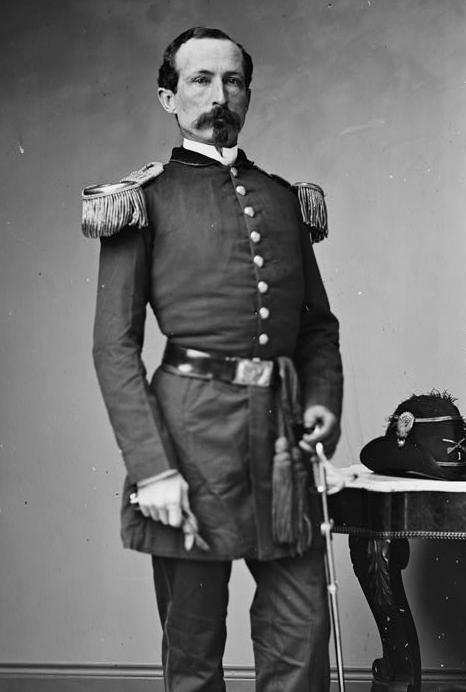 Francis Kilburn, who was transferred from the 5th Pennsylvania Reserves to gunboat service. D. P. Rosenmiller, a Navy officer. G. W. Jack, a Marine on board the steamer J. P. Jackson. A couple Lancasterians who had moved to Iowa and fought with regiments there. 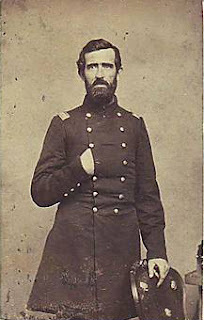 John McClure, of the 45th Pennsylvania, which made a somewhat odd tour with the Union Army's Ninth Corps to the Western Theater in 1863. A Lancaster officer (perhaps Capt. Bowman Bell) with the 15th U.S. Infantry at Shiloh. Today's letter comes from a company of hand-selected cavalrymen named the "Anderson Troop," which was supposed to be an elite group of men raised all over Pennsylvania, many of whom were connected to the Pennsylvania Railroad. 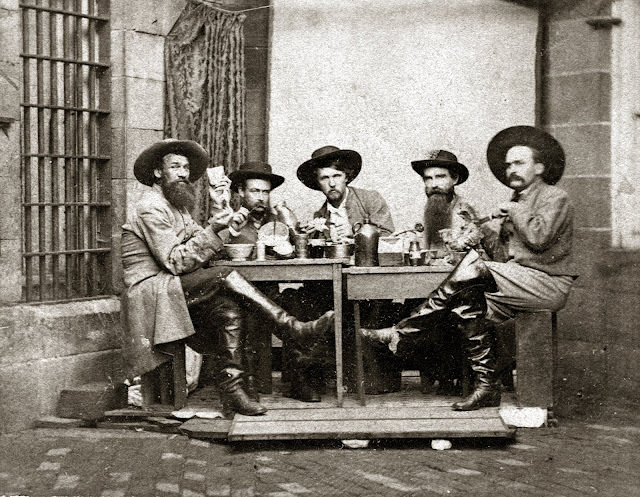 They formed with the intent of offering their services as the personal bodyguard of hero of Fort Sumter Robert Anderson while he was the commander of the Department of the Cumberland. However, once Anderson resigned command on account of ill health, subsequent army commanders retained the "Anderson Troop" for headquarters work. Presumably, this meant acting as couriers and escorts. 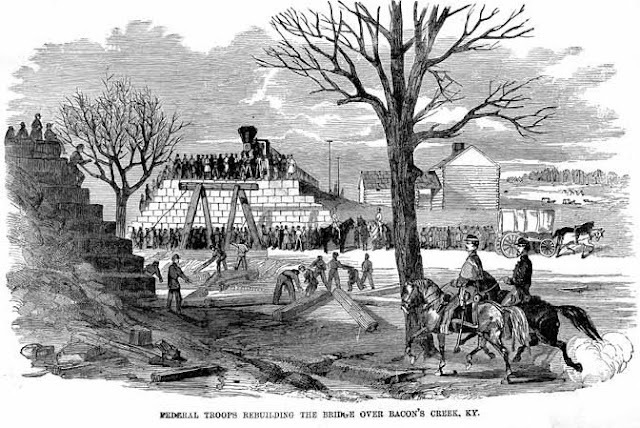 They arrived in Kentucky in early December 1861, and went to work for Army of the Ohio commander Don Carlos Buell. 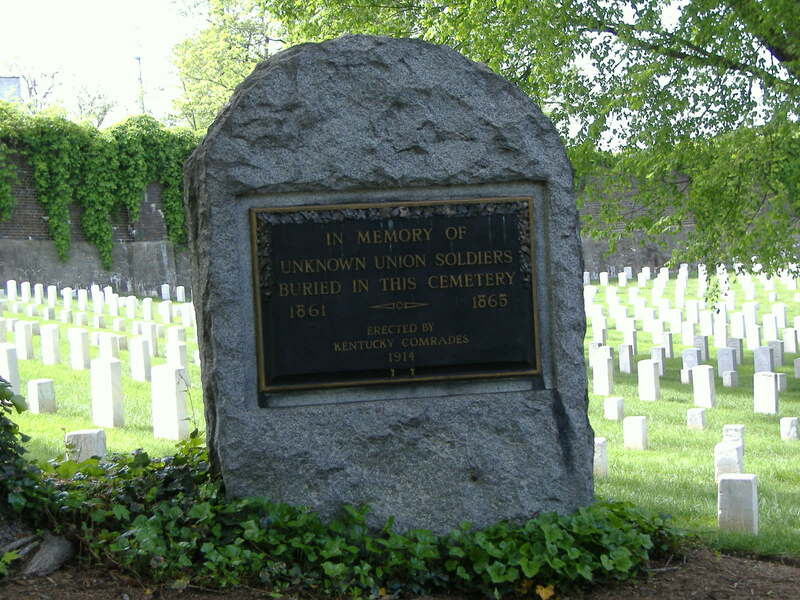 Lancaster County contributed two men to the Anderson Troop, Christian Musselman and John Archibald McLenegan--two Strasburg Academy schoolmates who grew up in that part of Lancaster County. Presumably, either one of them wrote the letter below. Both had successful industrial careers after the war, and you can read their biographies: Christian Musselman (bio), John Archibald McLenegan (bio). One of their social connections was Corp. Henry Witmer Miller of Company I, 79th Pennsylvania, whose letters are housed at Penn State's Paterno Library, and Miller mentions meeting up with them once or twice in his letters [12/14/1861]. 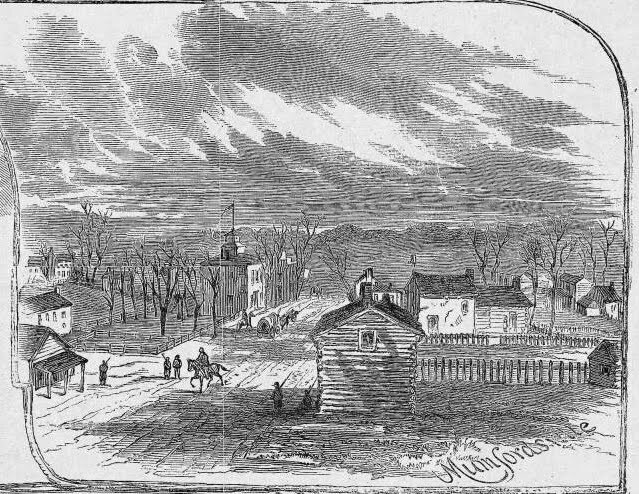 I missed this letter a couple days ago, so let's go back to December 16, 1861, and Bacon Creek Station with the 77th Pennsylvania, which had recently and unhappily been transferred from Negley's Brigade to the command of Brig. Gen. Thomas J. Wood. Both versions of "Camp Wood," one near Bacon Creek Station and the other at Munfordville, were named after the general, who was a native of Munfordville. Behold us then on the super-sacred soil of South Carolina, and nary bloody hand has welcomed us to ary hospitable grave thus far. We were all upside down for a little while, but the Colonel [Thomas Welsh of Columbia] soon reduced us to order. 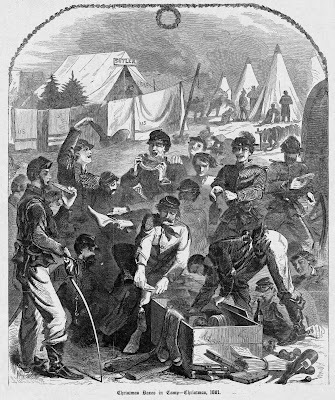 The boys generally went into bathing and oyster hunting, collecting curiosities, &c. At night the contraband (who arrived simultaneously with the northern invaders) afforded amusement by their grotesque dances, &c.
Otter Island, on which we are stationed is some three miles in length by a width of two and a half miles. It seems never to have been cultivated, but commands a very prominent point on St. Helena Sound. Hutchinson Island, opposite, is highly cultivated, and grows cotton abundantly, but the crops have either been removed or burned. 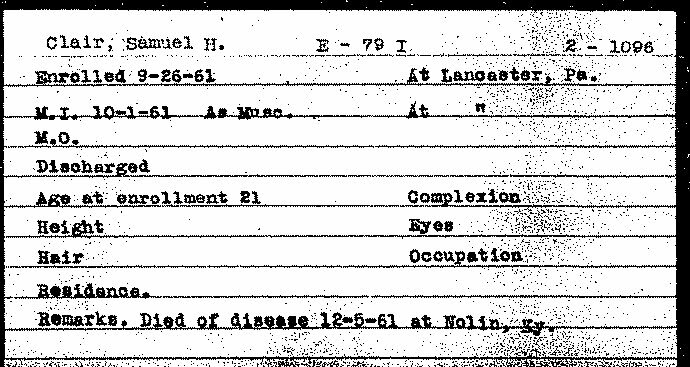 Unfortunately, I mostly won't be posting on these letters, as telling the story of the 79th Pennsylvania fully consumes my blogging time capacity, but I just wanted to point out their existence and online availability for anyone who might be interested. I'm compiling a list of the letters for my own use as a go through the newspapers, and I might polish it at some point and publish it online. I hope that the resurrection of some of these stories as for entertainment, inspiration, and analysis becomes a hallmark of the Civil War sesquicentennial, as we begin to care not just what was going through the mind of Generals Grant and Lee but also, for instance, what was going through the mind of some corporal from Columbia who found himself building quarters on Hilton Head Island, South Carolina, for some of the first slaves liberated by Union armies. Pennsylvania Civil War Newspapers Project (includes Lancaster Intelligencer, Columbia Spy, and the Weekly Mariettian), which you can search and browse by paper. Albert, Allen D. (Editor) History of the Forty-Fifth Regiment Pennsylvania Volunteer Infantry, 1861-1865, Williamsport, Pennsylvania, 1912. 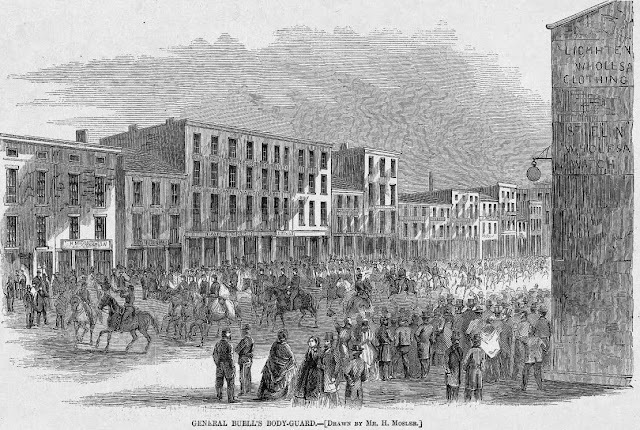 Also providing commentary from South Carolina was Franklin and Marshall College Class of 1861 Valedictorian Adam Cyrus Reinoehl, who wrote back to the Daily Evening Express throughout the war under the name, "Demas." Around this time in late 1861, one Confederate officer entered the consciousness of the men of the 79th Pennsylvania and the rest of the Union regiments slowly crawling their way down the Louisville and Nashville Railroad. 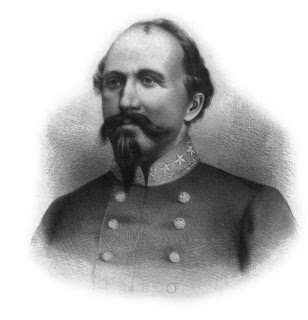 Captain John Hunt Morgan, leader of an irregular company of Confederate cavalrymen, began a series of daring raids in the area that confounded the Union advance and made picket duty in rural Kentucky a lot more interesting for soldiers in McCook's Division. With the success of his raids in Kentucky through 1862 and the national attention they received, Morgan's rank in the Confederate army rose so that he became the colonel of a cavalry regiment and then a brigadier general, eventually leading a raid deep into Ohio (which ended in the capture of him and his command) in the summer of 1863. 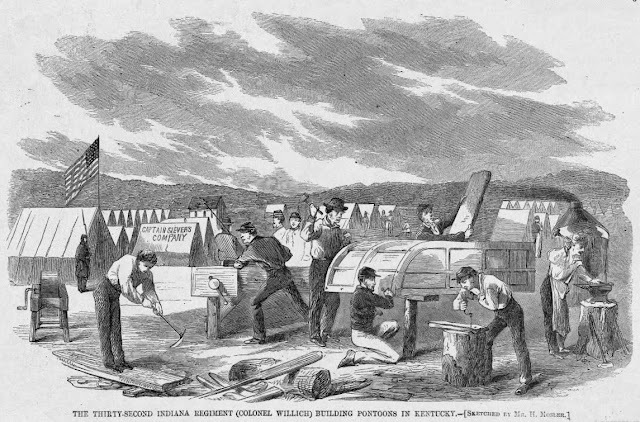 Through 1862, Morgan's operations often intersected with the 79th Pennsylvania's operations, and resulted in the Lancaster County Regiment spending much of the year running around the back roads of Kentucky and Tennessee trying to protect infrastructure and supplies from Morgan. 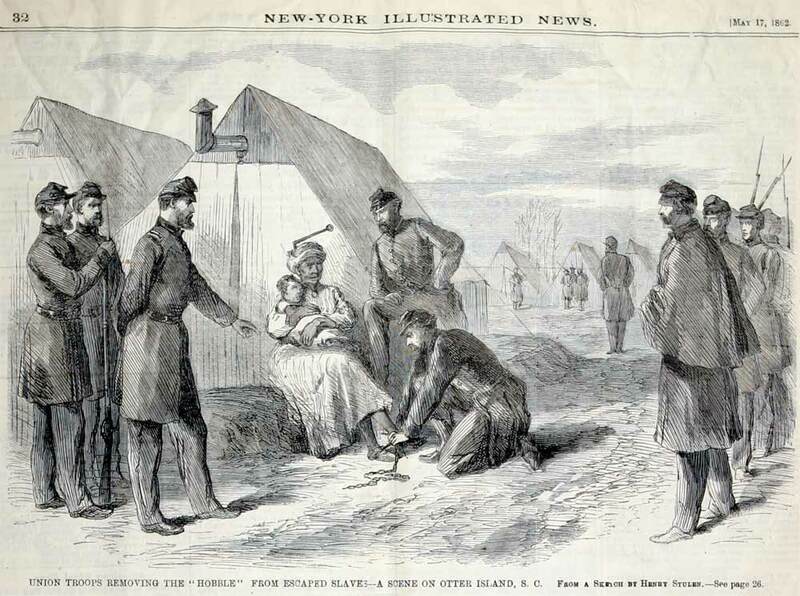 Morgan even gained enough notoriety that his name became a verb in the Lancasterians' lexicon, as in many of the wounded members of the 79th Pennsylvania in field hospitals after the Battle of Perryville, Kentucky, were "morganized" when Morgan's cavalry captured and paroled them in October 1862 [INQ, 10/29/1862]. A large detail of the 79th Pennsylvania was captured by Morgan while building telegraph lines in May 1862, and Captain William G. Kendrick of Company A even got to eat dinner with his captor, but that's another story for another time. 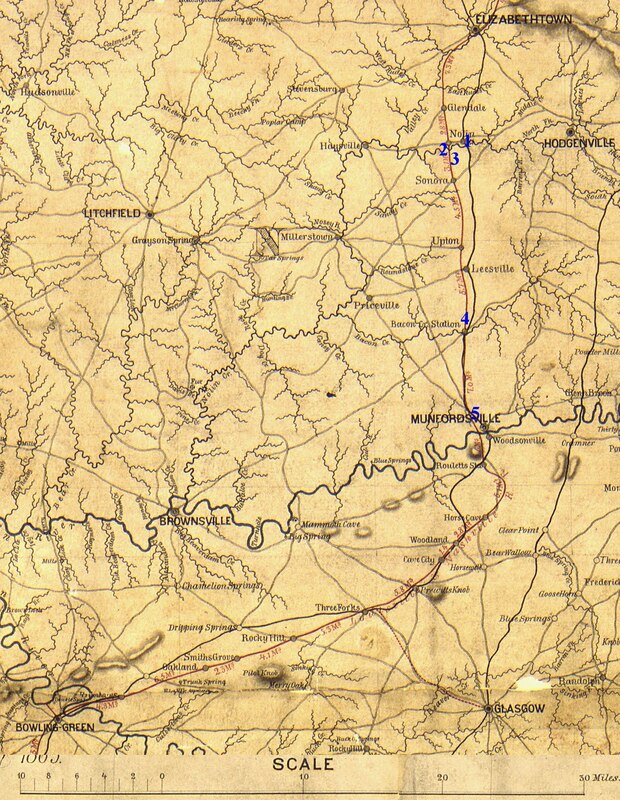 McCook's division had no cavalry or no effective cavalry and was basically blind at this time. This meant the men of the 79th Pennsylvania spent many of their days on company-sized scouting expeditions with 100 or 200 men going out a couple miles into the countryside to investigate rumors or see what they could find. Also, any shots heard in the distance or rumor had to be taken seriously as there was no way to tell if it was just a couple Confederate cavalrymen causing trouble or the whole Confederate army marching up the road. Both sides relied on civilians as a system of information and alarm. Morgan even played a sort of repeated cat-and-mouse game on his raids with civilians who would see him and dash back to Union lines.